The headlines predicted that 2018 would be the sequel to the Retail Apocalypse of 2017. The news was frequently flooded with stories about the death of Brick and Mortar, saying traditional retail was giving way to the rise of E-commerce. Shoppers were going to be trading in their grocery carts for an Echo Dot or a Google Home. The store closures of major brands were used as evidence: Sears and Kmart, followed by Toys’R’Us, Mattress Firm, Abercrombie and Fitch and others started closing their doors. But the professionals in the CRE industry aren’t quite as quick to accept the death of retail. In fact, they witnessed something entirely different within the world of Brick and Mortar in 2018. While retail sales online have grown (just under 10% of all retail sales), in many sectors, store sales have not only grown, but have thrived recently. Statistics have shown that products such as books and games are preferred to be purchased online. But Americans still continue to purchase cars, jewelry, appliances and other items in person. Individuals still hold in high regard the ability to feel and test products as well as have the instant gratification of being able to walk out of the store with the product in hand. The fundamentals of brick and mortar remain strong as retailers are not passively sitting on the sideline and watching their market evolve. Billions of dollars are being invested into E-commerce by some of the largest retailers in the world. The old adage of fight or flight could not be more true today as traditional retailers such as Walmart, Target, Kroger and Publix pour billions of dollars into their e-commerce platforms alongside billions of dollars being invested in updating their locations in an effort to enhance the shoppers experience. Conversely, e-commerce retailers are taking the fights for sales to the streets – realizing that to be truly competitive they have to have a brick and mortar presence. E-commerce retailers such as Amazon, Warby Parker, Untuckit and Caspers are opening up hundreds of brick and mortar locations. As confirmation, Walmart’s most recent earnings call reported that Q4 blew past expectations amid strong U.S. same-store sales growth and surging online sales, posting its best holiday quarter in years. Same-store sales rose 4.2% in the quarter, destroying estimates. On the earnings call, Walmart said it will spend the most money in the 2019 on store remodels, e-commerce and bulking up its supply chain. The stats support that brick and mortar retail has evolved and stabilized. Overall vacancies remained flat in 2018 with vacancies in regional and super regional malls dropping almost one percent. The market has proven to be resilient in absorbing the large number of square footage from store closures across the US. Why did vacancy rates not soar and rental rates plummet? The explanation is simple, the “Retail Apocalypse” was overblown. In peeling back the layers of the store closures, the statistics are encouraging. In 2017 there were 21 major retailers that filed bankruptcy, in 2018 there were 16. 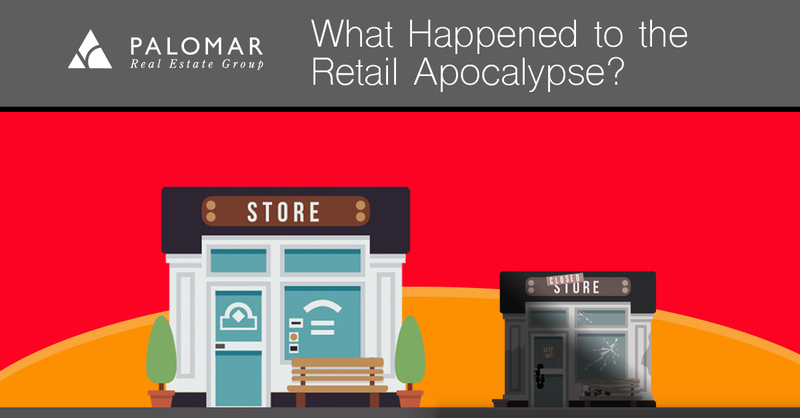 While the impact of store closures was not as catastrophic as many believed, the industry will still have to deal with the fate of struggling retailers such as ShopKo, Gap, Nieman Marcus, Chicos, White House Black Market and JC Penny. Ratings firm Moody’s recently released a list of 34 distressed retailers to keep an eye on. With more store closures evident, 2018’s market resiliency shows that the retail sector will survive and evolve – presenting great opportunities for e-commerce retailers to secure brick and mortar locations, or for up and coming retailers to lease space. All industries deal with businesses that are thriving and businesses that are struggling. Struggling businesses are either overburdened with debt restricting their ability to evolve, or have simply never chosen to evolve, giving up market share to businesses that are more mobile and forward thinking in embracing and utilizing technology. Majority of retailers that have fallen by the wayside shared the common trait of poor credit and debt as the underlying critical flaw, prohibiting them from adapting and evolving. A positive over the next 12 -24 months is there’s not a ton of debt coming due in 2019 and 2020. Strong retailers continue to have access to the capital markets, weak retailers will have challenges as they will have to pay up and deal with less favorable debt terms. Apocalypse or not apocalypse, it’s full steam ahead for The Palomar Group. Reach out to us today for any of your Investment Sales needs or to discuss the offerings we have coming down our pipeline.